According to a recent online article in Editor & Publisher, a Nielsen Scarborough study suggested “that in an average month, 169 million adults read a U.S. newspaper. They may be reading it in one or more iterations—in print, on the web, via a mobile app, courtesy of an e-newsletter or through a social media news feed.” www.editorandpublisher.com/ . Some 58 percent of people ages 16 and older reported they regularly read newspapers. There are not noteworthy differences across communities in the numbers of people who regularly read newspapers. But 57 percent of suburban residents and 56 percent of urban dwellers are more likely to read their newspapers on handheld devices than 45 percent of rural residents, according to a 2012 article by the Pew Research Center. www.pewinternet.org. “Print isn’t going away. If you are from Cleveland, then you were probably one of the thousands who wanted a print copy of the Plain Dealer that was released the day after the Cavaliers won the NBA Championship…So why in the digital era would people from all over want the print version? Nostalgia. The print newspaper is memorabilia people can keep forever.” www.advance-ohio.com/. “A newspaper is the center of a community, it's one of the tent poles of the community, and that's not going to be replaced by Web sites and blogs,” declared Michael Connelly. And I agree. Whatever country you reside in, the newspaper is a vital source of information. 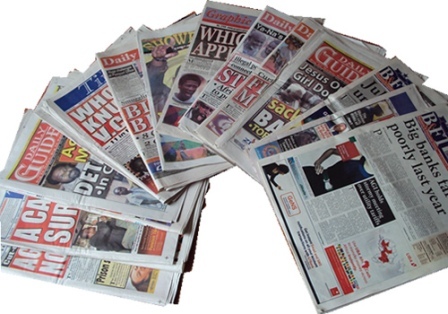 News and opinions circle the globe via newspapers. Stand up for the free press. It’s that important. Melissa Martin is an author and columnist. She lives in U.S. www.melissamartinchildrensauthor.com . The author has authored 2 publications on Modern Ghana. Disclaimer: "The views/contents expressed in this article are the sole responsibility of Melissa Martin and do not neccessarily reflect those of Modern Ghana. Modern Ghana will not be responsible or liable for any inaccurate or incorrect statements contained in this article."